It put a caterpillar on the back on my neck. Was I out in the garden when this happened? Had I been in the garden before it happened? I’d been sitting at my desk in my workspace like a good little trooper, albeit one that was getting a little excited over recent personal developments, when I felt a tiny pinprick of sensation on my neck. Thinking it was just a hair that had escaped the confines of my bun, I brushed my hand against it and picked up something that was soft and wormy. I suppressed my first reaction and brought it before my eyes. It was a black and brown caterpillar, doing perfectly fine. 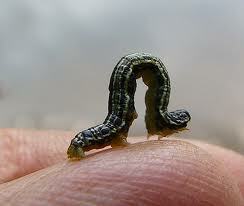 Caterpillars are associated with good luck and new birth. In the second stage of metamorphosis the caterpillar feeds to gain strength and build a foundation before the cocooning stage begins. This stage is when we give birth to new ideas and new creativity which hones the foundation to allow a new expression of life. The caterpillar represents new birth and new foundation and is a symbol of good luck in the early phase of new actions. Caterpillars usually signify a need for gentle and quiet approaches to our activities and endeavors. They can also signal a surprise or gift about to be offered to us, or that can be beneficial to our future if we take advantage of it. Caterpillars herald a time of good news, new birth, and creative inspiration, signaling a time to get ready to start a new project or initiate a new endeavors. The appearance of the caterpillar reminds us to be cautious in starting our new endeavors. We should protect and disguise them as much as possible as we pursue them. If we do so, we will see rapid growth and we will experience the birth of a new foundation. Caterpillars can also indicate obstacles within our path. They may even indicate that a person or persons are blocking our growth or serve as a reminder that we must look at things and people around us realistically at this time. Failure to do so will slow down our progress. And caterpillar also reminds us that new growth cannot occur unless the old is shed as the caterpillar grows quickly and must replace its skills with some caterpillars shedding their skins every few days to make room for a bigger body. A caterpillar showing up may indicate that we are refusing to shed the old that we have outgrown. I liked the message, it’s a good one. Did I really need it on my neck?